Such a quirky take on this, love it! Great photo. Have only heard about the deliciousness of the trdelnik and look forward to giving one a try. Is the taste similar to country fair funnel cake? We’ve only had funnel cake once and we don’t recall it tasting the same. Hmmm… trying to think about how best to describe the taste. The outside is crispy and the inside is soft. Similar to maybe a really really thin donut but with a “crunch” on the outside. But it’s not oily because it’s not deep-fried. Oooh – we didn’t realise Germany had it too… and a much easier pronunciation at that 😉 Time for us to pay Germany a visit!! hahaha yes, I guess sometimes German isnt that bad compared to other languages! Yes, it would be fabulous to come to Germany and visit you and all the other German bloggers we have met online 🙂 You all are soooo lovely! I haven’t had the opportunity to try one of those – yet! I’ve seen some in Budapest but I’ve never tried any ! Thanks Laura! We appreciate comments such as these 🙂 It always makes us smile and feel rather accomplished! Hahaha – YES we did take a bite… can you tell? 😉 After we bit into it, we thought we better take a photo for memories sake. Then as we positioned it, the taxi drove into view!! 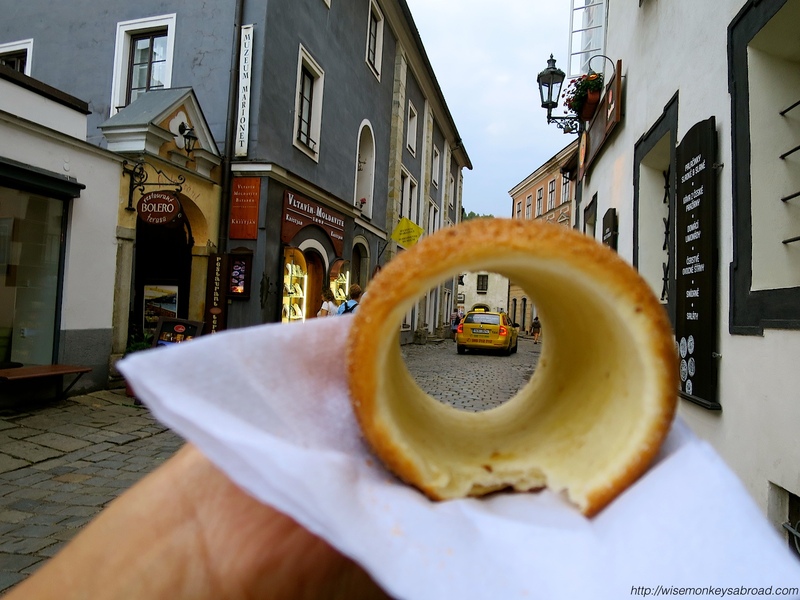 Fun photo… I bet the trdelnik is good in the depths of one’s tummy as well! Sounds good. Yes, Jane! Definitely VERY good in the depths of our tummies 🙂 Hope you are having an amazing weekend. Capturing the car in the perfect spot makes this shot great. It’s all about timing 🙂 Thanks for your comment! 🙂 Appreciate you stopping by and leaving that comment! Nice shot, Monkeys, Yummy too! Fabulously creative idea for this theme! Can you believe even though I have such a sweet tooth, I only found out about Trdelnik last year meaning that when I was in Prague many years ago, I totally missed out on trying these 😦 Looks so good!! How on earth do you pronounce that word? It does sound delicious. Maybe. Would that be cheating though? ? Envy could be playing a part in my thoughts! I see trade link too! Thanks Janet! Hope your weekend is treating you well! PS – that taxi thing was just timing. We were surprised at the outcome of this picture. Timing is everything, isn’t it? Yes! 🙂 they were wicked good, those kurtoskalacs. Thanks for stopping by and leaving your comment! Hope you are having a fabulous weekend. Cant wait to try one of these….cinnamon on anything is delicious. I have seen the Hungarian ones. I will give them a go next time! Thanks Curt – we struggled a little with this one but glad we found something we were happy to share 🙂 Hope your Sunday is going well.